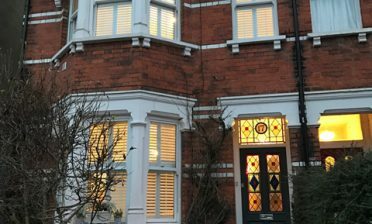 A customer local to us in West Wickham was looking for an alternative to their small bay window curtains which would work with the windows to not only emphasise the shape and angles, but also allow for light and privacy adjustment whenever required. We created this perfect solution using full height shutters with mid rails towards the top of all panels which were designed to mirror the lines of the windows set behind. 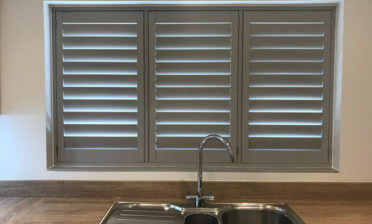 The shutters were created using MDF which makes for an affordable alternative to our hardwood ranges, while still maintaining a quality look and feel when finished. 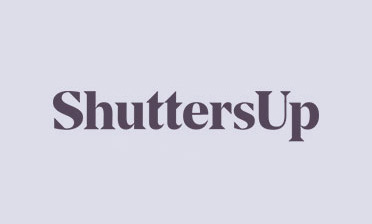 The shutters feature 76mm louvres with centralised tilt rods for ease of adjustment and to help create the specific look that the customer was looking to achieve. We like the way that centralised tilt rods create an elegant and traditional look which works with many different homes and room decors. This room’s decor was unique in the fact that the walls of the room were painted in darker colours which contrasted fantastically with not only the pure white shutters, but also the window sill and skirting. 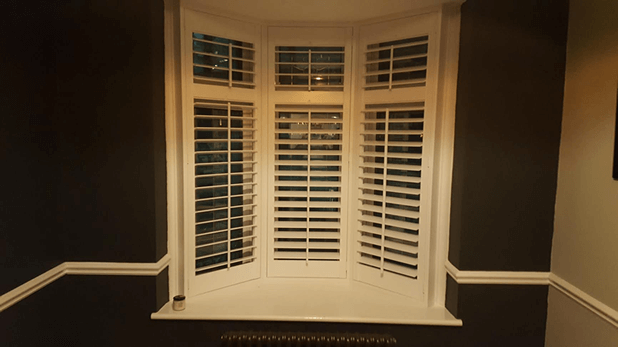 This is a perfect example of our shutters not only acting as a functional window dressing, but also as a focal point of the room. The customer was over the moon with the finished product.